Jon & Kate Plus 8 - Back to "Normal"
There is no doubt about it, when it comes to Reality TV, Jon and Kate Gosselin and their family, were pioneers charting unknown waters. Their TV series, Jon & Kate Plus 8 and then Kate Plus 8 (minus Jon, post-divorce), gave America insight into what it was like to parent 6 toddlers and preschool twins. Along with the chaos and joys we expected to see with so many babies under one roof, we also got to watch perfectionist Kate and laid-back Jon handle each other, their big family, and their growing fame and fortune. Eventually we watched as their marriage imploded and scandal swirled around Jon and his string of girlfriends. Many said that theirs was a cautionary tale for those stepping into the unknown territory of Reality TV: Stop in your tracks and run the other way. It’s been two years since their program was dropped by TLC and it’s obvious that their lives are very different now. One thing hasn’t changed, though. 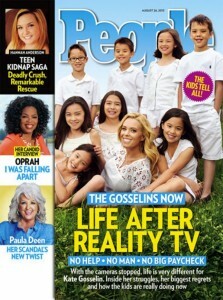 Kate Gosselin and her adorable children still look great on a magazine cover! Kate and the kids graced the cover of this week’s People magazine (on newsstands today) and the family talks about how much their lives have changed in the last two years. Even “private guy” Jon Gosselin has something to say again, breaking his (almost) 4-week silence on how he’s happiest not giving interviews. For Kate and the kids, gone are the days of luxury vacations, babysitters and housekeepers, and long-time bodyguard, Steve Nield. Now the family lives a quiet, “normal” life in the sprawling home purchased at the height of the show’s success in 2008. Jon lives in the woods. Although Kate says she is “more laid-back, and I realize now what is important,” she has not quite embraced Jon’s philosophy (shared with dadsroundtable.com last month) that he needs “to support them emotionally not financially. They’ll be taken care of.” Nope. Kate is worried about a future without a steady paycheck. Luckily, one of their parents is. Kate says she is living “very carefully” and is trying to piece together an income. She won’t go back to nursing as long as babysitter’s fees would eat most of the paycheck. “So it needs to be something else. I have to make lightning strike.” Instead she is earning money from her website, KatePlusMy8.com, has a new cookbook coming out next month called Love Is in the Mix; and just started a brand new retail discounts website, CouponsByKate.com. Would she consider doing another TV show with her former husband? Nope. “I am not that girl,” Kate says regarding people who would do anything to get on TV. People reports there have been multiple offers for a show featuring both Kate and Jon together. Jon says he is open to a gig on TV. Is this the source of some of his bitterness toward his “former wife” in recent interviews? Kate won’t make that TV gig happen for him? In last month’s dadsroundtable.com interview, Jon shared that he would be starting a new job this month that works better with his custody schedule. He appears to be in between jobs frequently and most recently it was noted on twitter that he is now waiting tables. Not that you can believe everything you read on Twitter, but serving tables would offer flexible hours so that Jon could maintain his custody time with his children every other weekend and for dinner Tuesday nights. And while that’s nowhere near the 50/50 custody split imagined by some of Kate’s detractors, waiting tables may give Jon time to see his children in sports and school activities again. As for the kids, how have they fared? Despite rumors and predictions that the kids would be doomed for failure that other child stars have incurred, they are happy and thriving. On that, both parents agree. People reports, “the children- animated, amusing, chatting away to visitors- giggle constantly.” Kate calls them, “loving, funny, and bright.” In Jon’s interview last month he shared, “They’re going to beat each other up and going to fight and it’s not perfect at all.” Well, at least People and Kate agree, the kids are doing great. They look well and happy and like they just might actually eat the $300-$450 worth of food Jon claims he buys for them each weekend. Psst! Here’s a hint for Jon: you can probably save some money on your weekend food bill by downloading a few coupons. And we know just where to get them! Dontcha Go Dissin' Honey Boo Boo! Great post! If the kids eat that much now, just wait a few more years! He’d do we’ll to start using coupons. I just checked out her coupon website. I’m a couponer and I was curious. I think it’s pretty obvious she’s not a real coupon user. She just threw up a WordPress blog and installed a coupon code plug-in. Looks like a quick attempt to cash in on the couponing craze. I think she is a real couponer but her site does need work. Jon is right. Those kids need emotional support. All Kate ever did was yell at everyone, and that was with a camera in her face. Imagine what she’s like when no one is watching! I joined couponsbykate.com and have already printed 2 coupons I will use for my next shopping adventure. Why attempt to turn Kate’s venture that she is obviously excited about into something negative? I hope her site is a resounding success and I will support it and her endeavors to support her family. Re: #4 Janine yes Jon is correct that his kids need emotional support but since his emotions are more juvenile than his children’s I don’t have any faith that he can give any support at all. Nurturing, loving, and being a positive influence while providing the basic necessities is the foundation all children require. Jon’s very shaky foundation does not lend itself to any of these. Yes, Kate yelled, but not at everyone, mostly Jon 99% of the time. It is a difficult undertaking to have 6 babies and 2 toddlers with a husband/father who was the biggest most self centered baby in the family. And FYI Jon did a fair amount of yelling himself with cameras on and a large amount of it to the children. I don’t excuse Kate but much of her yelling at Jon was total frustration. I don’t excuse Jon either but having re-watched the shows many times I conclude that his yelling at the kids was just mean and childish. Kate is not perfect and Jon is most certainly not the saint that the Kate detractors paint him as or wish him to be. Why turn it into something negative? I was being honest. The website was not a unique coupon site and had very little actual coupons. It was a basic wordpress coupon code app plug-in that anyone could have up in a matter of a few minutes minus her picture all over. If it had been anything worthwhile I would have shared it with friends, family, and my local couponing group. I have no issues with Kate personally. I just love and depend on legitimate coupon blogs and was disappointed when I checked it out and realized what it was (and wasn’t). I thought with her status and the fact that she is actively promoting it that it would of been a legitimate couponers blog, nit just a plug-in app that can be added to any blog. I am not a “couponer”. Oh, I use coupons, but only if I would have bought the item anyway. I have a small home and no storage so I don’t buy at the discounts store in bulk either. I need to check out the coupon sites you are talking about to compare to Kate’s site. I think Kate is a couponer, but I think she is more invested in her family eating organic/healthy food. She’s made a decision to pay higher prices for fresher, whole foods. I rarely find great coupons for organic foods compared to the processed/preserved stuff that is cheaper already. I hope she is able to find some of those coupons and share them on her site. Jon’s idea of giving ’emotional support’ is living a Peter Pan life while ‘the former wife’ who sits on a ‘pile of cash’ can do the heavy lifting by providing food, clothing, shelter, health care and an education. Janine, you call it support, I call it a deadbeat. I really don’t know much about coupons or coupon sites since we don’t do much of that here and I don’t really “do” coupons a lot. I will have to check out her site in more detail. I just glanced at it. It sounds like this family is finding their “normal” and that is a good thing. I remember Kate was an avid couponer on the show – way before it became a craze. I will check her site out. Sadly Jon came across trying hard to impress the interviewer, than caring about the children. I can’t imagine talking negatively about my children when i know the outcome will be in print. I dont really use coupons but i really like the idea of saving money! We, too, buy mostly organic- if she finds coupons for that id be all over it. Great article. I wish Kate much success on her coupon site and also her cookbook. I know nothing about how good or bad her coupon site is. Jennie, I remember Kate being a couponer too. I remember the show where she did all the shopping while the little ones were napping. She timed it just right to arrive back as they were awakening. Kate had her grocery shopping down to science. Jon is waiting tables? Oh my. He has to keep the lights on somehow. I wish him success too. In the roundtable interview, Jon talked about the family being more important than his job, but yet he hadn’t been to any of Cara’s games. It’s a shame he doesn’t see Cara and Mady much. Cara seemed close to her dad when she was younger, but things do change. The Jon from the show was nothing like Jon showed himself to be after he and Kate split up. Maybe the kids fight and argue with each other when they get around their dad. New girlfriend and tight living quarters would piss off 8 kids. Maybe that’s why the kids do not all visit at the same time. 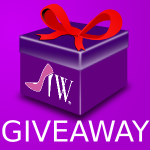 BTW ladies of Imperfect Women………. I use coupons, so any site that has good offers, I pay attention to. Haven’t had time to check out Kate’s enough to know what is really there. I look for soap, paper products, and holiday specials. Wishing her success, with 8 mouths to feed, it takes lots. I wish Jon would not complain how tough life is for him, buckle up, and just do his part. Good luck to Kate in all her ventures. Kate is a fighter, she will never roll over and give up like the haters want her to. Hope Jon finds a steady job and sticks with it. I’m a couponer too. So I absolutely checked out the site. It is just like a couple of other coupon sites in the first months. Baby steps guys. You start with a handful and as your site traffic grows you can add and then when you get really big you have exclusives. Basically the more people use her coupon links the more links she’ll be able to negotiate. So if you coupon just keep watching. It’s my understanding from someone that runs one that it takes a lot of time if you do it right. Calling coupon distributers etc. Yes, there are companies that manage other companies on line coupons. Documenting traffic etc. So lets see if it takes off. And if anyone was watching and commenting on the yelling then they know that one of the meltdowns to Jon was ‘we never buy anything without a coupon’. So good luck to her and I did use a free shipping coupon and just looked for it at one other site, they didn’t have it. So she got a nice starter package and if she has the right traffic she’ll be getting more as the days go on. Good luck to her. Between her penny pinching ways and a little extra income hopefully life stays steady for the kids even without any support from their dad. Thanks, MarieS for the heads-up on how these coupon sites work. I am not really a couponer (though I have a lot of respect for those of you who do it!) so I’m not the best person to judge. Frankly, all the coupon sites (Coupon Cabin, Retail Me Not, etc) seem to me to have the same stuff and a lot of times it’s not really relevant to me or I find I can get a code on the store site itself. Interesting about ‘exclusives’ though. I like Kate and supporting this venture of hers is easy so I’ll continue to check it out and use the links when I can. I did buy People, but haven’t read the article yet, so I appreciate the highlights. The pictures are great. What a good looking group! I do believe the children are thriving and that is great to see. I give the majority of the credit to Kate, but I won’t exclude Jon. At least it appears he is trying to stay involved with his kids. It’s a shame he can’t provide more financial support. Hopefully, this latest job really works out. Maybe he could move up to manager or something. I mean it sincerely that I wish him the best because it can only benefit the kids to have two parents that are emotionally AND financially doing the best they can for them.